One of the breed books I own “The Encyclopedia of Dog Breeds” by D. Caroline Coile, PhD., grades each breed on various characteristics from 5 (the best) to 1 (the worst).Two of the categories are friendliness towards strangers and friendliness towards other dogs – both crucial to pet grooming where we are strangers and your pet is surrounded by other dogs. Here is a sampling of the findings. Over 200 professional dog obedience judges also ranked 110 dog breeds by intelligence. 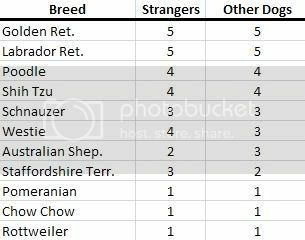 The top five in order are: Border Collie, Poodle, German Shepherd, Golden Retriever, and Doberman. The last five in order are: Borzoi, Chow Chow, Bulldog, Basenji, and Afghan Hound. This entry was posted on Saturday, October 3rd, 2009 at 11:29 am	and is filed under Breeds: As Related to Grooming. You can follow any responses to this entry through the RSS 2.0 feed. You can leave a response, or trackback from your own site.